We've made it even easier to bring sustainability to roadway design by putting our free LCA tool in the cloud. The Athena Sustainable Materials Institute has released a web version of Pavement LCA, its popular and free life cycle assessment (LCA) tool for roadways. The easy-to-use software tool calculates the environmental impact of Canadian regional roadway designs. Pavement LCA allows custom roadway design, or users can draw from a library of existing designs. The software provides environmental impact results for all life cycle stages – materials manufacturing, roadway construction, use, and rehabilitation – and enables quick and easy comparison of multiple design options over a range of expected roadway lifespans. Life cycle assessment (LCA) is the science behind environmental footprinting. The Athena Sustainable Materials Institute is North America’s leader in bringing LCA to the construction sector. 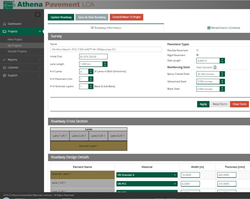 The web version of Pavement LCA includes several improved features, such as better report graphics and spreadsheet export capabilities. Learn more and find the online tool at PavementLCA.com. For projects in the US, users can download the desktop version of the software, which includes all the same features as the web tool and is suitable for both Canada and the US. The desktop version is available for download from Athena’s software website, calculatelca.com. The Athena Institute provides this tool for free thanks to the support of the Cement Association of Canada and its other members. The Athena Institute is a non-profit consultancy and think tank in life cycle assessment (LCA) for the built environment. The North American pioneer in construction-sector LCA, the Athena Institute works with sustainability leaders in product manufacturing, building design, construction, and green rating programs to enable smaller footprints in the production and consumption of materials, buildings and infrastructure. Athena’s common-good work includes free LCA software tools for architects and engineers and the development and maintenance of a large LCI/LCA database on construction materials and processes that underlies our tools. We additionally advocate and educate on the benefit of LCA in construction practice and in industry in order to help meet our mandate to mitigate the environmental burdens embodied in works of construction. Our support network includes a range of product manufacturers, trade associations, design professionals and other research organizations.